Welcome to the latest installment of Wololo Wednesday, warriors! Before we get into the September challenge, let me just say that you guys blew us away with your towns. If I could have picked everyone to win, I would have. (I asked. They told me no.) If you missed last month’s challenge but want to see everyone’s submissions, be sure to check out the submission thread. I have always wanted to live in a indigenous colony, because I think people without guns and cars and resources and borders live happily and teach us what it means to survive. My colony here is probably the best representation of what I’ve in my mind. My entire town, The Blue king has set up his war camp next to a small hamlet preparing to attack the Reds city. The Blue king with his guards, Supplies coming in from the hamlet. Red arches at the walls, Red king is ready for a charge if neccesary. South of the warcamp a group of barbarians has taken over a island outpost. At the hamlets church a Red heathen is converted. Regular hustle and bustle of the town, the hamlets lord visites a grave. North of the war camp is a trading port and lumberjacks are working. It might not be very appealing to most living so close to war but I think it would be pretty exiting and interesting, Perhaps I would be a barbarian or soldier. Anyways hope you liked it, i spend many a hour compiling all the screenshots in Paint. God bless Paint. Even though I like mighty empires, huge cities and impenetrable fortresses, after the stress (and the glory) of a long campaign I do enjoy the peaceful life of Ael. Ael is a small hamlet sitting between mountains. Build around a robust town center, the hamlet counts only a few dozens inhabitants (which are not all present here, you should also imagine kids running all around and old people talking about good old times on a bench by the river…). Even a blacksmith near the river as well as some military to defends themselves if needed. One of my Favorite Cities I would like to have is a Town protected with walls, surrounded by a ditch with a bridge that unites the river with the shore. Inside there’s a road that stretches around the city to all locations, sorted by Economic, Religious, Civilian and Military buildings with an Aqueduct that supplies water to its residents, and its main square for all (Friendly) visitors that would like to take a walk or have fun inside the Coliseum. The city is sorted at specific locations for quick access to every need, this is for me the best way to have an organized and practical management for my troops and villagers so they can get its maximum effectiveness during game-play. Town Center: The Town center is filled with farms, a mill with haystacks and villagers to help the agricultural part of the city with its production in a organized style. Military Training Camp and Recruitment: Here Soldiers, prepare themselves together to improve their skills ant abilities to fight and defend the city of intruders, this section of the city is organized by two Military buildings of the same type(Archery, Barracks & Stables). City Center: Once my citizens are in need of entertainment they can go to the old coliseum to rest and have fun with the plays and sports that are performed inside. The kingdom’s city mines: Here is the most treasured part of the city, which hold all of the mining resources to increase the economic reserves in time of need. Congratulations again to the winners for this month! If you’re here just looking for September’s theme, you’re in luck because it’s time for that right now. One of the big discussion topics lately has been the ending to the most recent season of Game of Thrones. The next season won’t be along for quite a while which means we have plenty of time to speculate and talk about what we think the final battle of the show will be like. What we’d love to see from you guys this month is what you think the final battle will look like. It can be elaborate, it can be simple, but it should be awesome. Your entry MUST include an image and must relate to an Age of Empires game (or an illustration having to do with one). You may also include a written portion explaining your entry that may be no more than 600 characters in length (not including spaces); if your entry includes non-English words, you must provide an accurate English translation of those words in your written portion. We’ll pick our five favorites, and the winners will each be able to choose two of the below prizes! 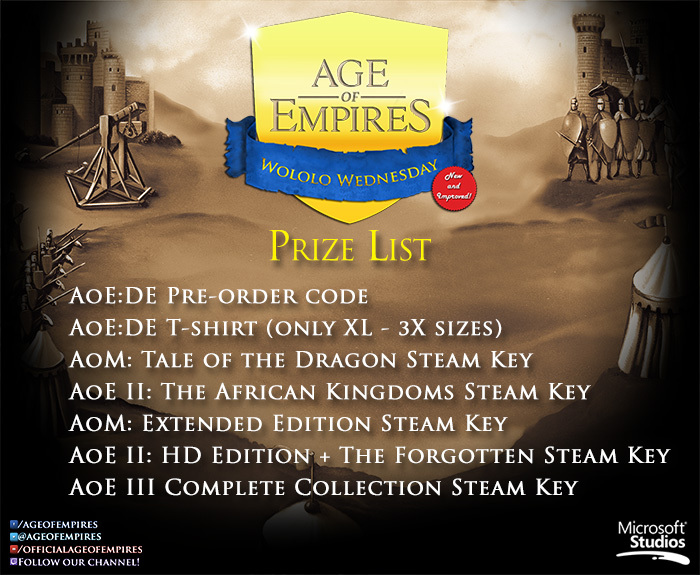 We’ll reach out to the winners via private message on forums.ageofempires.com, so keep an eye on your inbox! Submissions must be appropriate, and must be submitted in the forum discussion thread here before 5:00 PM PDT on September 30th, 2017. You can find the full official rules here.